I didn’t get the full Adidas machine blast that Dustin Johnson and Martin Laird were put through to demonstrate the Adidas GORE-TEX rainwear at the Open Championship last year at Muirfield, but Lisbon, Portugal, did throw up a few storms – especially at Royal Obidos and Oitavos Dunes – to give me a chance to put the rain suit through its paces. The first thing I noticed was how comfortable, and, most importantly for a golfer, how easy it was to be able to swing my golf club without feeling restricted. Sometimes I like to take off my jacket so that I feel like I’m getting a proper swing on the ball, but there was no need for that with this new GORE-TEX jacket. For me, Lisbon was the perfect testing ground because it was raining hard but still warm, which can be a problem for most waterproof rain gear as you start to get to hot and sticky. 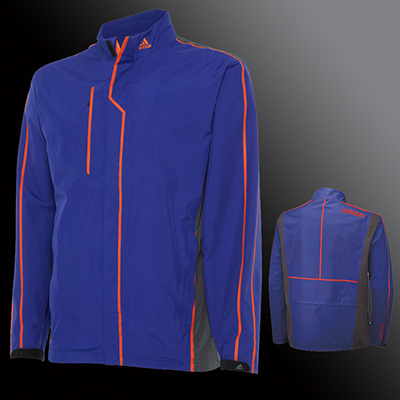 Adidas, however, has incorporated breathability into the suit, which will leave you feeling comfortable. In addition, the technology used within the jacket and trousers makes them incredibly high-performing, and designed to give you fall protection from both the wind and rain. Jacket: The jacket is a two-layer, fully seamed and sealed jacket with articulation at the elbows for added comfort. The front is doubly secure, with a Velcro enclosure that stops any rain getting through the zip. 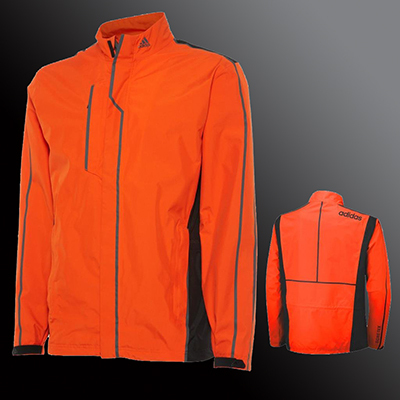 The lightweight jacket is engineered to allow moisture vapour to escape, while keeping heavy wind and rain out, and designed to allow freedom of movement throughout your golf swing. 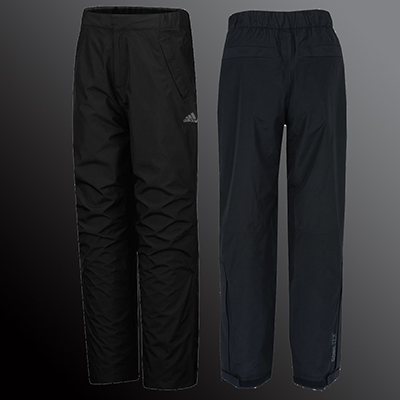 Trousers: The trousers are also a two-layer design. I particularly liked the ease with which they can be put on over normal trousers, plus they have zips along the bottom of the legs – and adjustable legs cuffs – that make putting the trousers on while wearing golf shoes even easier. There are fully waterproof welt pockets on both the front and back, so you can keep your pitch-repair tool, ball-marker and tees in the front pockets, while putting your scorecard and yardage chart in the back, secure in the knowledge that everything will still be dry when you get to the clubhouse. I liked the fact that there are four different colour combinations to choose from – I went for the blue with orange piping on the jacket. I liked the design and the fit, and can honestly say that it kept out all the rain that was thrown at us. The bonus for me was that although it was still warm in Lisbon, the breathability feature didn’t make it unbearable to wear. In fact, I not only kept the jacket on while playing, but also during rain breaks, which to me gives the Adidas GORE-TEX suit a very big thumbs-up. Looking for an orange Gore-Tex jacket for my client. Please advise.